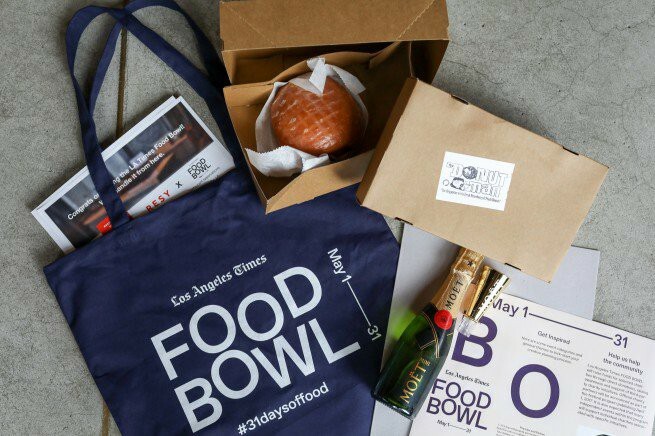 The first week of this month-long Los Angeles Times L.A. Food Bowl has been about so much more than food. Sandy Abrams, Entrepreneur in Residence @FoodFuture, Author Your Idea, Inc., Speaker, Blogger @HuffPostSmBiz, Entrepreneurial Storyteller, Yoga/Meditation & Food obsessed. It’s been an impactful week of raised awareness for the tough issues that surround the food industry. I’ve witnessed an incredibly creative and innovative culinary community supporting each other as well as supporting the dire issues that need to be solved like access to healthy food for all and minimizing food waste. This night set the stage for the spirit of generosity and camaraderie that seems to be an integral ingredient in the L.A. food scene. This was just a few of the enthusiastic and passionate group of chefs who want to cook up dishes that nourish the soul, community and the planet. As an entrepreneur, I’ve seen industries where the major players are bitter rivals and competition is fierce. But the food industry is different. With ‘food as medicine’ being a major topic of conversation today, there’s a cool collaborative connection between all of the players; chefs, food entrepreneurs, growers, farmers, manufacturers, brands, and retailers. Consumers are listening to chefs, chefs are listening to consumers and ultimately the marketplace is reflecting that conversation. A Deloitte white paper titled ‘Capitalizing on the Shifting Consumer Food Value Equation,’ states that consumers no longer purchase food solely based on just price, taste and convenience any longer. There are new ‘evolving value drivers,’ “This no longer reflects a niche portion of the market. These evolving value drivers include health and wellness, food safety, social impact, experience and transparency.” Consumers want to know where food comes from, how it’s produced and what the social and environmental foot print is. It’s difficult to wrap our heads around the numbers involved in food waste. FoodForward.org reports that, “The tragedy is that the United States is losing 40% of its food supply at time when hunger and food insecurity are growing. There are nearly 50 million people in the United States living in households without suitable access to healthy food, and it’s not because of food shortages or a lack of production. As our Founder and Executive Director puts it, “Hunger is a distribution problem, not a supply problem.” Food waste also constitutes a waste of resources on a massive national scale. We spend $165 billion and use 25% of our freshwater just to produce the food that gets thrown away.” Yup, that goes thrown away! There are many more events to come over the next three weeks of LA Food Bowl and there are plenty of seats left at the table! Here’s the schedule of events that range from panels, to cooking demos, to dinner experiences, cause related talks and events. There’s something on the menu for everyone. Regardless of your food preferences these days (vegan, gluten free, non-GMO, paleo, low carb…) your body, mind and spirit will feel good after participating in these events and continuing to raise awareness about the important evolution of the future of food. Food is an amazing connector, we all have an emotional attachment to food that can serve as a catalyst to help innovate and solve problems. If we begin to think about relating to food with more mindfulness we’ll have an abundance of way more than just food. Sandy Abrams is the founder of Moisture Jamzz, the author of Your Idea, Inc., and a contributor on HuffPost and Thrive Global. She credits her entrepreneurial success to her nearly 30 years of yoga and breath practice. She has consulted as a small business thought leader, content curator, and social influencer for brands like Capital One, LegalZoom, Sage software, and Marriott. Sandy also leads Breathe Like a Boss! and C.E.’Om workshops to share the power of breath for success. She lives in Los Angeles, California.